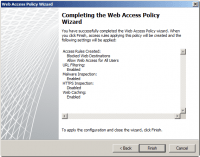 On this part, you will see how to configure web access policy for your organization. 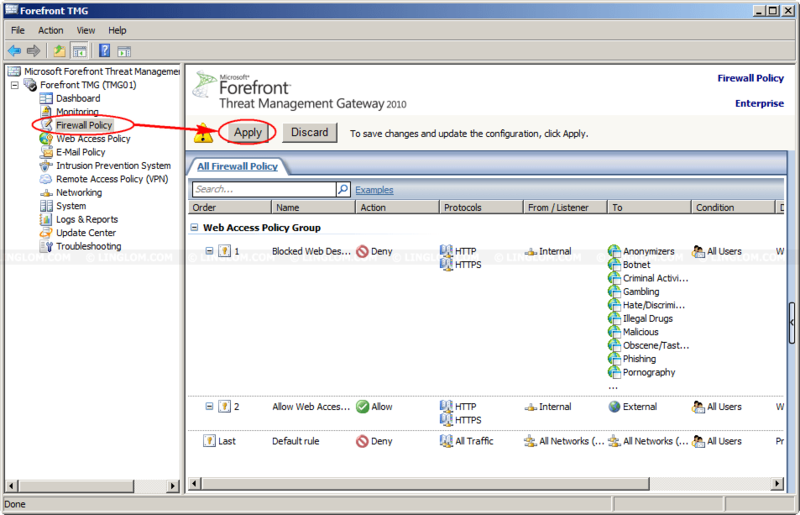 Forefront TMG 2010 provides web access policy wizard which helps you to create default web access rule on Forefront TMG server. 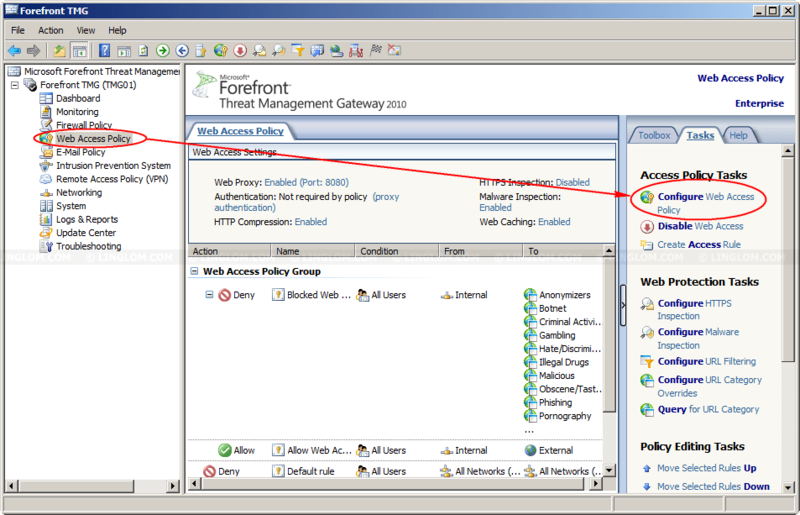 To run web access policy wizard, select Web Access Policy on Forefront TMG Management. 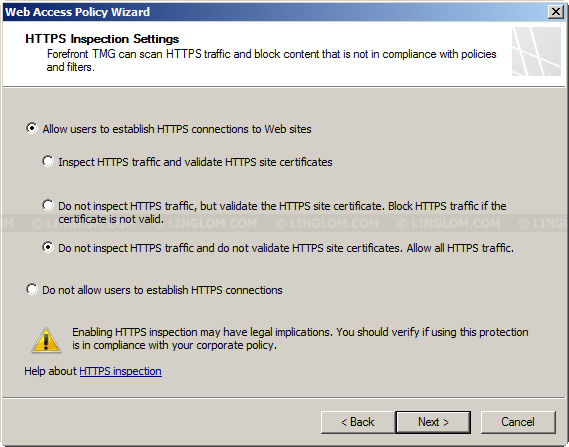 Click Configure Web Access Policy as in the figure below. If you continue from the previous part, just skip to next step. 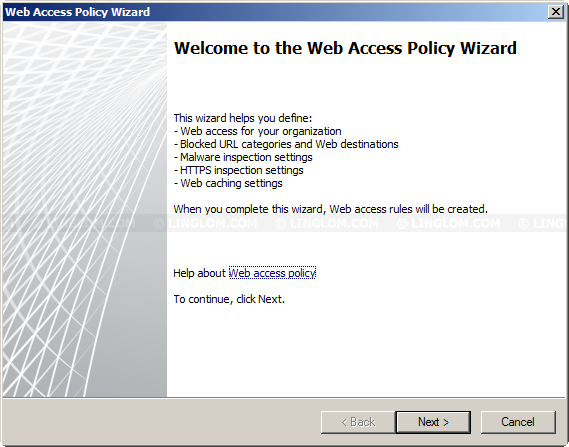 On Welcome to the Web Access Policy Wizard, click Next. 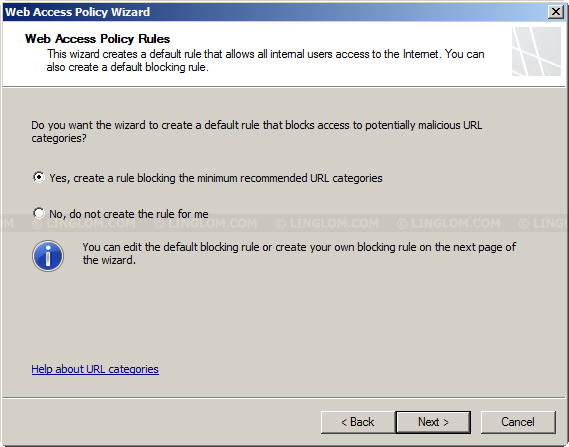 On Web Access Policy Rules, select Yes, create a rule blocking the minimum recommended URL categories to let the wizard create access rule to block pre-defined URL categories, such as gambling, illegal drugs, malicious, etc. Note: This is just URL categories only, no URL is blocked yet. 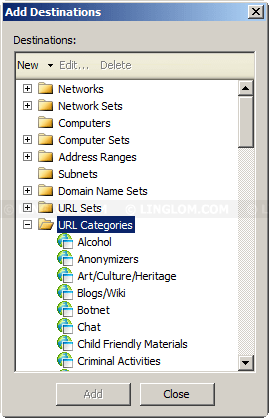 On Blocked Web Destinations, you can add or remove URL categories that are being blocked. 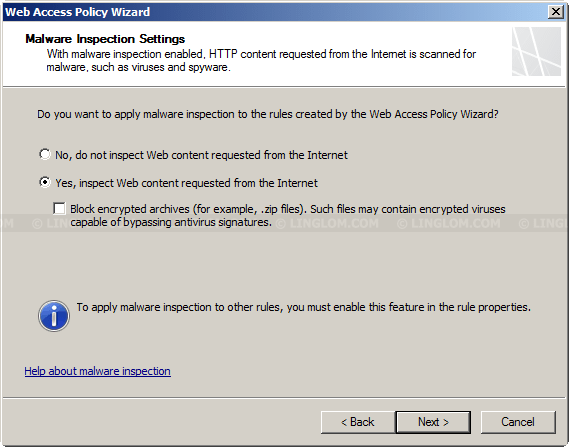 On Malware Inspection Settings, you have to choose whether to enable malware inspection on rules that will be created by the wizard. It is recommend to enable this feature. You can also blocked downloading encrypted archived file by tick Block encrypted archives box. On HTTPS Inspection Settings, you have to choose whether to enable HTTPS inspection and site certificate validation. 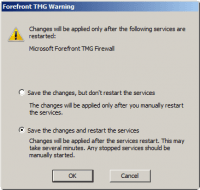 On Web Cache Configuration, you can configure web cache for Forefront TMG 2010. Cache is limit to 64 GB per partition. 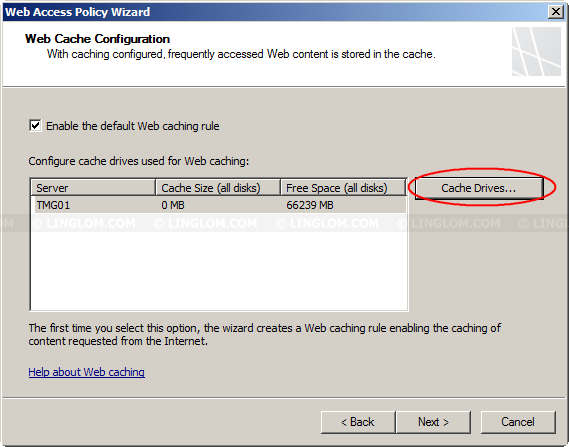 To enable cache, tick Enable the default Web caching rule box and click Cache Drives. 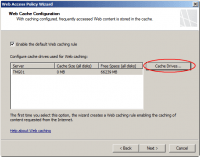 On Define Cache Drives, select drive/partition that you want and enter size in MB and click Set. On Completing the Web Access Policy Wizard, click Finish. 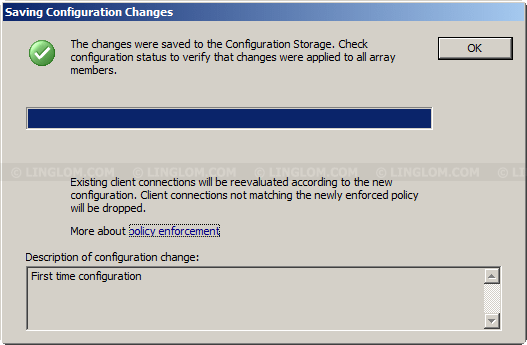 You have to apply changes in order to save any change and configuration made by web access policy wizard. Select Firewall Policy page and click Apply on top of the page. 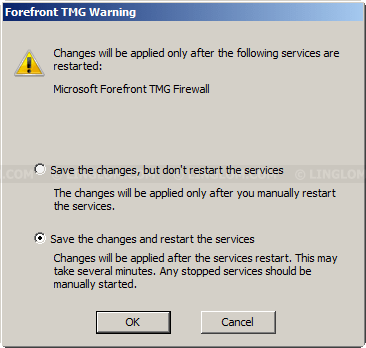 On Forefront TMG Warning, select Save the changes and restart the services to make changes applied to the server now. Then on Configuration Change Description, you can enter description for this changes. On Saving Change Configuration, click OK.